Just as I was leaving for the Imogen Heap concert on Thursday night, I encountered an automotive obstacle. My car, which had been showing no symptoms of illness, wouldn’t start. The battery seemed fine, as the radio and lights worked, but the engine wouldn’t turn over. Since I was at my parents’ house, they let me borrow their Civic for the night. My dad and Taylor did some diagnostics, and guessed the battery charge was low and hooked it up to charger overnight. In the morning, the car still wouldn’t start, so I picked up some jumper cables. Still no luck. We called up AAA to see if they had any ideas, and they had a repair shop on the line to listen to the squealing ignition noise. The car was towed off, and the repair shop had a diagnosis shortly thereafter. 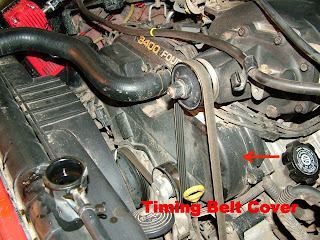 Timing belt and water pump. Luckily the timing belt was a non-invasive type, and the break didn’t damage the engine. Hopefully it will be done this afternoon. I’m grateful that the repair wasn’t as bad as it could have been. I’m grateful I had my dad and husband there to help diagnose the problem. I’m grateful for AAA. I’m grateful that Taylor gets paid his “big check” on Monday (every other paycheck has his perdiem pay) I’m grateful that the repair shop is also fixing my AC adapter. But mostly, I’m grateful this didn’t happen while on my way to California for Thanksgiving in 9 days. Heaven knows how bad it would be to get stuck needing repairs along the more desolate sections of I-15.